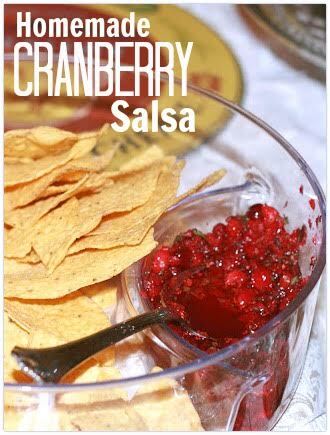 Have you tried to make cranberry salsa? It is so incredibly easy! We had friends from Maryland visit us a couple of years ago and brought all the ingredients to make it while they were here. It was so much fun to watch them work together chopping the cranberries and cilantro. They took over our kitchen and we really had a blast drinking wine while they worked their magic. The result were better than I could have imagined. I mean, I love salsa, but this, I could eat this on everything! I made their recipe for cranberry salsa for a party we had last month, and several people asked me for the recipe. I hope you enjoy it!